The total capacitance calculation for series and parallel circuits are similar to that of resistors. However, it's just the opposite. Thus, for parallel circuits, the total capacitance is the sum of all the individual capacitors parallel to each other. For series cirucits, then, the total capacitance is the inverse of the sum of all the inverse of the capacitors in series to each other. 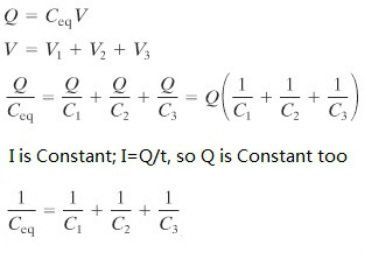 Below are the representative equations and the derivations, if the wording here is too confusing.